Restrooms are the main place where bacteria and infections spread, however you can eliminate this by installing one of our energy efficient hand dryers. As they include innovative technology, it results in the units being powerful, eco-friendly and cost effective, they cost less than 0.02p per use. This sheer quality of the units has resulted in us being accredited by The Carbon Trust. Some of our hand dryers have won awards due to the innovative technology that is used within them, such as the Gorillo Ultra has been recognised as the quietest in its class by The Noise Abatement Society. 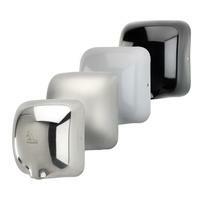 Take a look at our exclusive range of hand dryers. Depending on your specific requirements, we have different ranges available such as high speed hand dryers, blade hand dryers and quiet hand dryers.